The Chicago Cubs have started out their season with a series split against the St. Louis Cardinals, getting shutout on Opening Night and then shutting out the redbirds during their first day game of the season on Wednesday. Before the team starts out their next series against the Colorado Rockies (which we will be previewing this afternoon), we had some thoughts we wanted to share on the opening series of the season. 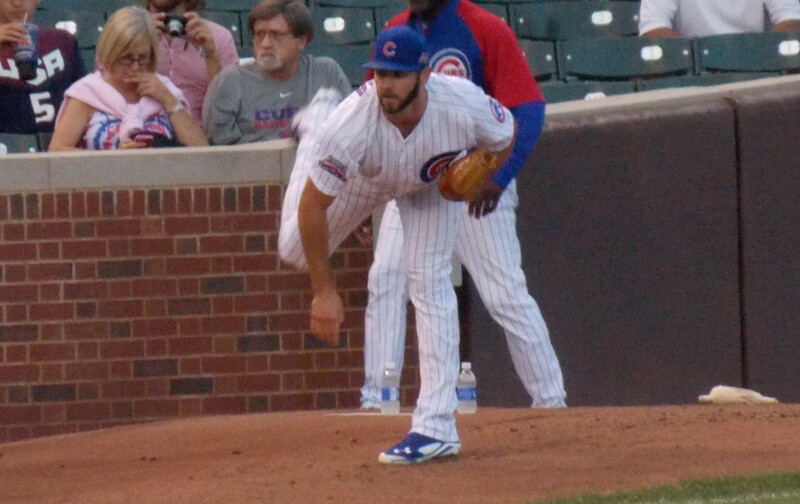 He looked wild in the first inning of the game, but he settled down in a big way on Wednesday afternoon as he pitched seven scoreless innings, striking out seven batters and walking three in a 2-0 victory for the Cubs. Arrieta is a player that is going to be a big key for the Cubs’ pitching rotation this season. A lot of attention is being paid to Jon Lester, and rightfully so, but the fact remains that Arrieta has the potential to make this rotation into a much stronger one if he can maintain his 2014 form, and if his effective performance against St. Louis is any indication, he’s hellbent on making sure there’s no regression on his part. A lot was made in the run-up to Opening Night about the fact that Lester hasn’t made a pick-off throw to first base since April of 2013, and that narrative gained a bit of steam on Sunday night as the Cardinals swiped three bases off of the Cubs’ hurler in the 3-0 victory. To his credit, Lester brushed off criticism of his approach to handling base runners. Lester is the type of pitcher that is going to emphasize changing speeds in his delivery in order to keep baserunners off balance, but it still does seem like he should at least consider throwing over every once in a while to help keep things under control. It’s definitely a story worth keeping an eye on. In two games, the Cubs are now 1-for-16 on the season with runners in scoring position, with their lone hit coming on Starlin Castro’s seventh inning single that knocked in Anthony Rizzo to give the Cubs the lead. Miguel Montero also lifted a sacrifice fly to right field in the game, and Castro scored to give the Cubs their second run of the season. Even though some fans are concerned about the team’s offensive woes so far, they have to remember two things: in the warm weather of Arizona, the ball carries farther, and the Cubs’ team power came to the forefront. The same thing should happen here. The other thing to remember is that Joe Maddon is still experimenting with lineups, and once he hits on the right combination, the team should score more runs. Panic is premature at this point. Obviously. Accordding to JJ Cooper of Baseball America, it only took Soler 11.7 seconds to get from home plate to third on the play. About the only way he could’ve gotten there faster would have been if he had run up the third base line instead.